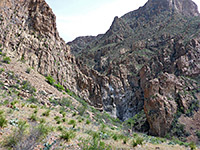 Oak Spring is a permanent water source in the western foothills of the Chisos Mountains in Big Bend National Park, along the Oak Creek drainage, and is used by the NPS to supply various facilities in Chisos Basin - the water is collected in a large tank and piped up into the hills. 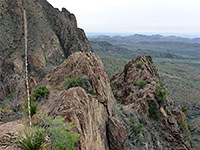 The spring is enclosed by a fence and is not accessible to the public, but the surroundings can be explored by the Oak Spring Trail, which connects the access track with the Window Trail from Chisos Basin; a 1.5 mile route, or 2.3 miles including part of the track, as the designated trailhead is 0.7 miles back, and beyond here, the road is blocked by a gate. 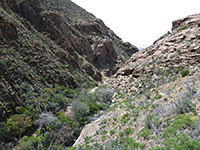 The path crosses undulating Chihuahuan Desert land for a little way then climbs quite steeply up the mountain sides, over a ridge and down into the lower portion of Oak Creek Canyon, close to the dramatic, 220 foot pour-off at the Window, which can be seen from above by a short, off-trail diversion. 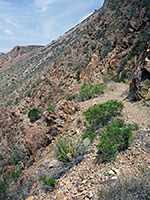 Most of the path has wide ranging views over the desert to the west, and all the route passes a good variety of cacti and wildflowers. 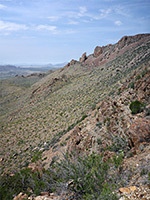 The east and of the Oak Spring Trail meets the Window Trail 0.3 miles before the pour-off and 1.9 miles from the (lower) trailhead in Chisos Basin, while the west end is 1.3 miles along a narrow, unsigned, unpaved but generally quite good track (Oak Spring Road) that forks east off Ross Maxwell Scenic Drive, opposite the pull-out for Sam Nail Ranch. The track winds across bushy land, over one drainage and into more sparsely vegetated surroundings, coming close to a low butte to the east, near the designated parking area. Past here, the track moves across a small wash, climbs slightly and drops down into the tree-lined drainage of Oak Creek, which is sometimes dry at this point. This is a shady location, a good place to cool off in summer, and the trunk of a sideways-growing oak tree makes a fine seat. A sign marks the start of the Cattail Falls Trail which forks off to the south, while the track continues, climbing up the far side of the creek towards the spring. 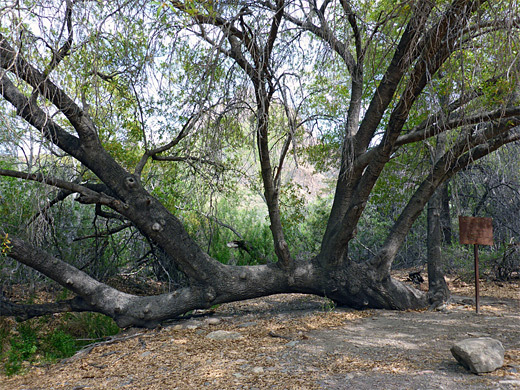 The actual path branches off to the north just before the gate enclosing the spring, where a notice gives the distance to the Window Trail as 1.5 miles. After leaving the track to Oak Spring, the trail ascends slightly then turns east, over open, undulating land; a shallow basin followed by a gentle incline, coming close to the base of the vertical pour-off below the Window. A hiker-made path heads south, back down into the rocky creekbed, which can be followed upstream all the way to the base of the cliffs. 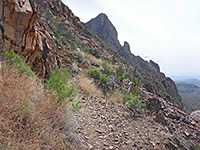 The official trail bends back north and starts a short series of switchbacks, climbing to a saddle at the base of a isolated, jagged pinnacle, which looks quite dramatic when viewed in front of the desert plains to the west. 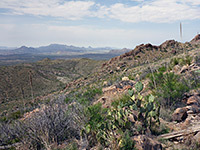 Vegetation hereabouts includes hedgehog cactus, prickly pear cactus and sotol. More, wider switchbacks take the trail higher up the mountainside, followed by a traverse southwards above a line of weathering cliffs, becoming briefly level on top of a ridge, above the canyon of Oak Creek; this is the high point of the hike, marked by a large, rusty iron object beside the path. 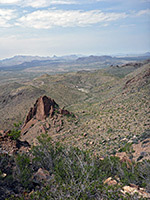 A walk southwest a short distance leads to a viewpoint high above the Window, while the trail turns southeast across an exposed, rocky, pinkish-brown hillside, soon coming close to the corridor of greenery around the streambed, and eventually meeting the Window Trail. 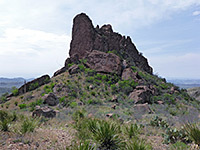 People often climb from here to the high viewpoint, but very few continue down to the western Oak Spring trailhead.